I.P. Pavlova is a busy transit point for many city commuters and as a result you have a MacDonald’s and KFC touting for business. If like me you prefer something a little more wholesome, with a kid’s corner and high chairs then you’ll be pleased to hear that Pizza Coloseum has opened their latest restaurant here. When I first arrived here many years ago Pizza Coloseum was one of only 2 places serving decent Pizza in Prague. Their first restaurant in Vodičkova opened in 1995 and you had to reserve a table well in advance or chance it that someone had just left as you arrived. I think we had a 30 percent success rate when turning up without a reservation - the place was always packed! These days Coloseum have six restaurants in Prague and one in Pruhonice which we regularly enjoy after walking in Pruhonice Park. So I’m kind of fond of this chain, they’ve been around a while, the food is fine and service generally good. 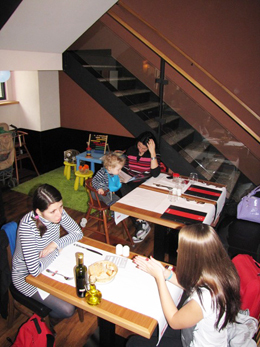 Not all of their restaurants have kid’s corners, just this one, Pruhonice, Andel and Mustek, which Darina has written about here. But all Coloseum restaurants have a pretty comprehensive kids menu which makes ordering easy. This particular restaurant has two entrances, one on the entry level to the metro and another on the corner of Legerova and Jugoslavska. 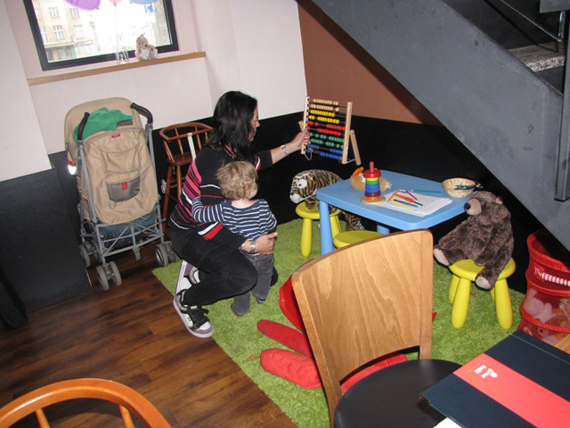 There are stairs to contend with so if you come with a pram it’s a bit tricky. I had some waiters help me when I was leaving but if no one is around you are on your own. 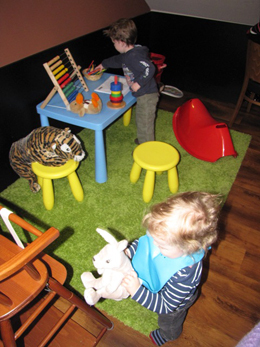 The restaurant has been pleasantly renovated and the kids area, although small, has enough offered (coloured pencils, paper, balloons, wooden and soft toys) to keep kids entertained before and after meals. A couple of issues besides the stairs - there is no area to place a stroller, I had to park mine up against the wall. Also there is a station for waiters right opposite the kid’s corner which is packed with glassware - luckily for me Ari did not race over and tackle the contents! Overall, it was a fantastic spot for me to meet my KIP friends as we all live in different areas of Prague. I took a tram from Prague 2, Karen got off the metro from Prague 8 and Darina had taken a tram from Prague 5 - perfect. We don’t get together very often so the transport hub of I.P. Pavlova and Coloseum was perfect especially with child attached. DIRECTIONS: BY METRO: Take the red line C to I.P. Pavlova. BY TRAM: Take tram numbers 14, 6, 10, 16 or 22 to I.P. Pavlova.